Superstructure or Bridge deck – the horizontal part of a bridge that support pedestrian or traffic activities. Bearings – transmit the load received from the decking on to the substructure. Piers or Abutments- Vertical member support the deck or bearing. This Method Prefer for Short Bridges. Time consuming is large in cast-in-situ construction as it involves following steps. This method is used for the long bridges. It is economical when there is large no of span. This method involves the following steps. Casting of Precast segments in casting yard. Transporting the precast segments at the site. Erection of the precast segment using launcher or crane. A Segmental Bridge is a bridge built in short sections (called segments), that is one piece at a time. And then segments are erected to make the bridge. 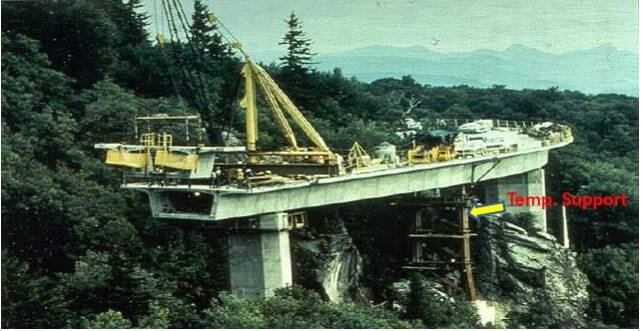 The bridge is either cast-in-place or precast. Very economical for long spans. Prefabricated segments provides more quality control. The structure can be fully loaded immediately after being prestressed. The pre-stressed cables can be inspected and replaced at all times. Low weight due to thin bridge sections. Industrialization of the construction process. High construction loading or high technology is used. Segmental bridge construction first appeared in the early 1950s. The first cast-in-place segmental concrete bridge, built in 1950, across the Lahn River in Germany. The first precast segmental concrete bridge, built in 1962, across the Seine River in France. 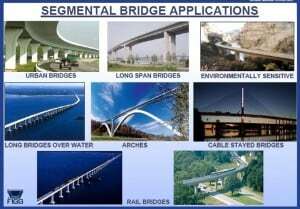 Classification of segmental bridges – Segmental bridges is classified under the following Categories. Short Line Method- In this rate of segment production is slow. Three or four segments cast at a time. Long Line Method- In this rate of segment production is fast. Segments equal to one span cast at a time. After casting the segments are stored at staking yard and curing of segments will be done. After casting or curing of segments are transferred at erection site with the help of traveler or crane. The precast segments are erected on the sites by following erection methods. High Machineries are used for the erection of segments some of the following. Epoxy Gluing- In between the two segments epoxy Glueing is used to prevent the leakage of grout during grouting. External perstressing –Used for giving the final strength to bridge. Grouting – The main purpose of grouting is to protect the all strands against corrosion and develop the bond between prestressing steel and surrounding concrete. 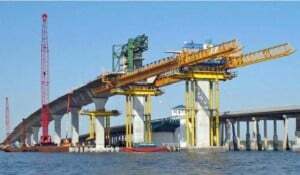 Sutong Bridge is the first precast segmental bridge built using short-line match-casting method in China. It was constructed using balanced cantilever method. Prestressed concrete continuous single-cell box girder structure was constructed precast segmental method. The construction of the precast segmental approach structures commenced in April 2004 and completed in early 2007. It consist of 30m, 50m or 75m long span. 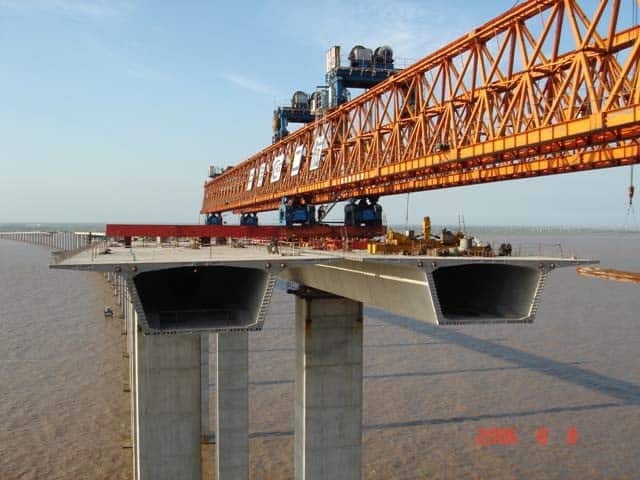 The total length of the box girder measured along its centerline was approximate 3.7km. 1.5 The reinforced concrete columns with 4.5m x 6.5m rectangular hollow section were adopted for the maximum height of 60m and supported on pile caps with bored pile foundation. Segment were casted in casting yard The casting yard was about 40,000m2 and equipped with 2 numbers of 160 ton gantry cranes for segment handling and 2 numbers of 16 ton gantry cranes for light duty tasks, such as, manipulating the reinforcement cage. The casting yard had a storage capacity of 354 segments based on two-layer stacking. The total erection period was about 15 months. Two overhead launching girders were used. Each girder had two winches with lifting capacities of 180 ton and 150 ton respectively. The lifting height of the winches was allowed for 70m. This method is ideal for bridge construction bridge give Aesthetical view or good quality. Longer span bridge now possible. Longer bridge over water now possible. Construction of long bridges now easy. Construction line is highly mechanized by this method.